Kaki fruit benefits Scientific name: Diospyros virginiana. Persimmon, also known as the Divine Fruit’ due to its scientific name of Greek origin, is found during autumn. The popular one is the Chinese native, Diospyros kaki, widely known as the Japanese persimmon. Persimmons can be eaten fresh, dried, raw, or cooked, which changes the flavor, but they are generally sweet and pulpy. If allowed to ripen fully, the flesh can almost be scooped out with a spoon. 1. Aids Weight Loss :A medium sized fruit offers just 31 grams of carbohydrates. The fruit has hardly any fat in it. These two factors make it an ideal friend for those who wish to snack on while trying to shed those extra pounds! 2. Prevents Cancer : Prevent Cancer : Fruit is packed with antioxidants, the anti-cancer agents that can boost your body’s ability to fight free radicals, improve overall health and protect against many diseases. Persimmons have high levels of vitamin C and A, as well as phenolic compounds like catechins and gallocatechins, which are directly connected to preventing different types of cancer. 3. Boost Immunity : Persimmons contain betulinic acid, which is a proven anti-tumor compound. This can reduce the chances of contracting tumors by inducing apoptosis, also known as programmed cell death, and if you already have a tumor, it can reduce the size and stop cancer from metastasizing. Persimmons help boost immunity due to the presence of vitamin C. They have one of the highest ascorbic acid (vitamin C) content among other fruits and a single persimmon has approximately 80% of the daily requirement of this beneficial nutrient. Vitamin C stimulates the immune system and increases the production of white blood cells, which are the primary line of defense for the body against microbial, viral, and fungal infections, as well as foreign bodies or toxins. 4. Aid in Digestion : Like most fruits, persimmons are a good source of fiber, containing almost 20% of the daily requirement in a single serving. Fiber helps the body process food in a more efficient way by adding bulk to the stool, stimulating peristaltic motion to move the food through the digestive tract, increasing secretions of gastric and digestive juices, and relieving symptoms of constipation and diarrhea. Overall, a high-fiber fruit like persimmons can be a major boost to your gastrointestinal system and can protect you from colorectal cancer and other similar diseases. It can also help people lose weight by defending them against lipid uptake, which can cause obesity. 5.. Prevent Premature Aging :Persimmons are rich in a number of vitamins, specifically vitamin A, beta-carotene, lutein, lycopene, and cryptoxanthin. These vitamins function as antioxidants in the body to reduce oxidative stress and prevent signs of premature aging, like wrinkles, age spots, Alzheimer’s disease, fatigue, loss of vision, muscles weakness, and a number of other conditions. 6.Improve Vision .The compounds in persimmons also have a proven benefit for the health of your eyes! 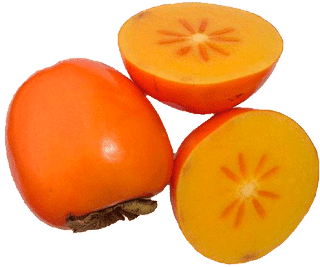 Zeaxanthin, a member of the B complex of vitamins, present in persimmons, is directly linked to improved eye health due to its behavior as an antioxidant substance. Studies show that this compound reduces macular degeneration, cataracts, and night blindness. 7. Control Blood Pressure : Potassium is another mineral found in significant quantities in persimmons. Potassium can act as a vasodilator and lower blood pressure, thereby increasing blood flow to various parts of the body. Low blood pressure also reduces strain on the cardiovascular system and prevents various heart diseases from occurring. Persimmons also contain various vasodilating organic compounds that further lower blood pressure, making them a very good fruit for heart health. 8. Regulate Blood Circulation . Along with lowering blood pressure, persimmons provide copper, an essential element in creating new red blood cells. Without copper, you cannot uptake various essential nutrients to make additional hemoglobin. Increased circulation of healthy red blood cells increases cognitive function, muscle tone, metabolism, and energy levels, as well as wound repair and cellular growth. 9. Improve Metabolic Activity : Persimmons contain elements of the B complex of vitamins like pyridoxine, folic acid, and thiamin, which are all essential parts of various enzymatic processes and metabolic functions throughout the body. And these elements ensure that your body’s systems function efficiently and effectively, thereby increasing your overall metabolism. Further, persimmons can boost energy levels, increase muscle tone, and improve digestion. Being diuretic in nature, persimmon can put a stop to water retention as well as increase the amount of urine flowing through the kidneys. High in potassium, it ensures that no significant mineral is lost during urination.